Yes, we are the masters at satisfying all your catering needs. We spitbraai a whole skapie in just over 2 hours. We don’t skrik for bad weather. No smoke – No mess – No fuss. We supply everything – from the food to the DJ. Party for 10 000 people?? Hmpf... no problem!! Check out our scrumptious Spitbraai Menus. These menus run straight through the year. With a choice of Lamb, Beef or Pork and 27 extras to choose from - this menu is always a winner! This is your ideal option for weddings and corporate functions. We serve the buffet at your venue and prepared the food at our premises. Why not hire our photobooth and make lasting memories! Good luck in choosing between steak, chop, chicken, wors and ribs for the braai - not to mention the lamb neck and creamy chicken potjie... And that is just the main course! The Nyama Full House Breakfast has arrived! We thought it best not to add our Mobile Bar option here - but... even though we make better food than yo Momma, we are NOT yo Momma! Inviting everyone you know and everybody they know?? 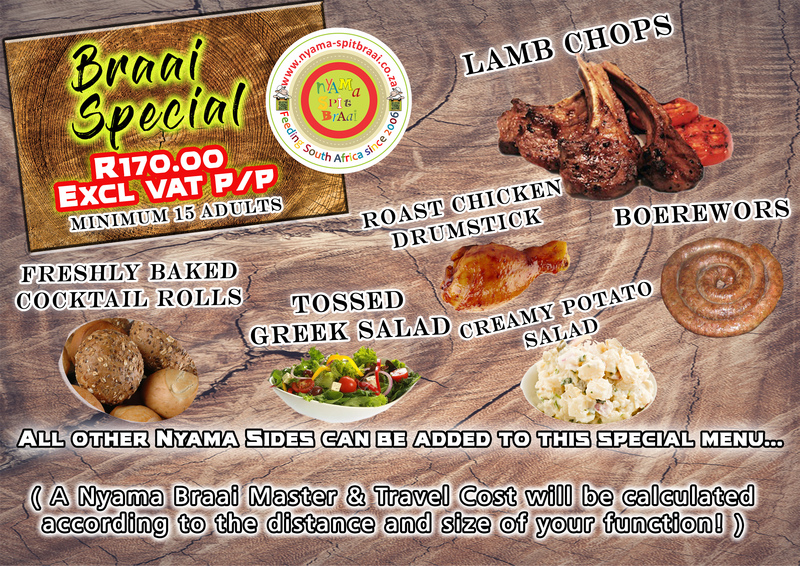 Then our Great Ox Braai Menu is designed specially for you. This option is available for a minimum of 300 people - so go BIG or go home! 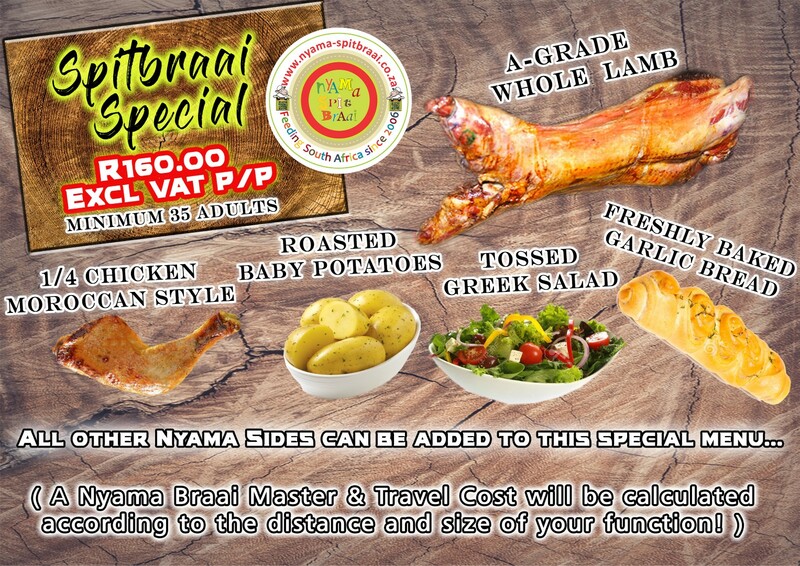 Nyama Spitbraai has been feeding the South African nation since 2006, with passion, glory and pride. Everyone at Nyama Spitbraai is passionate, to a somewhat unhealthy extent, about creating stylish, stunning & mouth-watering events. Our food is addictive, our service is unparalleled, our quality is assured and our commitment is a guarantee for the success of your function.